Most women are used to experiencing a wide range of -often rare- symptoms throughout their life, such as those related to naturally fluctuating hormones during menstruation, pregnancy, or menopause. But not all women experience an unpleasant neurological phenomenon, called Lhermitte's sign, which can be caused by numerous factors. Read on to learn the most important information about Lhermitte's sign. Lhermitte's sign is a medical term for an abrupt sensation of electric shocks traveling from the neck down the spine. It often occurs when the neck is bent forward or flexed suddenly at the wrong angle. It is named after a French neurologist, Jean Lhermitte, who first discovered it. Lhermitte's sign is also commonly called the barber chair phenomenon. What Are the Symptoms of Lhermitte's Sign? The symptoms of Lhermitte's sign are described as experiencing sudden lightening-like jolts or electric shocks starting in the neck and spreading across the back. In some women, these shocks also extend to the upper and lower extremities. Usually not accompanied by pain, these symptoms are typically brief and fade away a on their own. How Is Lhermitte's Sign Related to Multiple Sclerosis? 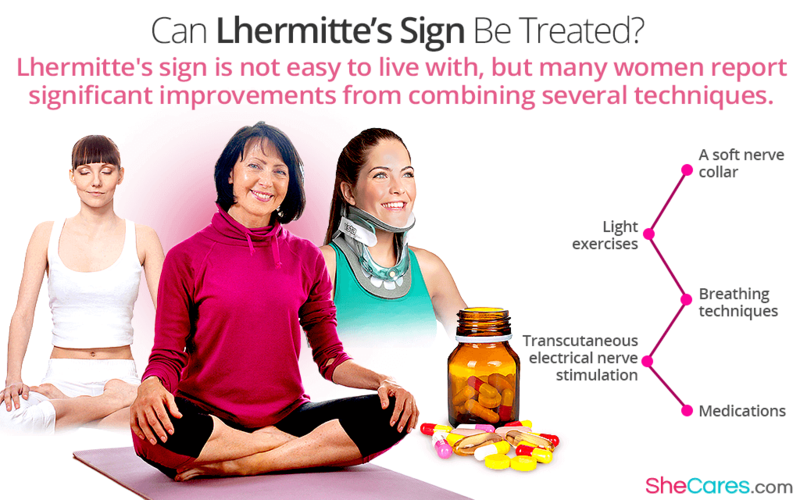 Lhermitte's Sign is mainly associated with multiple sclerosis (MS), which is an autoimmune disorder affecting the central nervous system, but not all women with MS experience electric shocks in their neck and back. The underlying reason for Lhermitte's sign is related to the demyelination and hyper-excitability of the nerves, causing them to misfire and bring about various sudden physical symptoms, such as electric shock sensations. Can Lhermitte's Sign Be Treated? Since Lhermitte's sign is frequently initiated at a sudden flexion of the neck, women suffering from it should try to avoid those movements that trigger an onset of electric shocks. A soft neck brace or collar might help you keep your neck stable. Light exercises, such as yoga, can help you keep the right posture and maintain strong back and abdominal muscles to alleviate the attacks of Lhermitte's sign. Breathing techniques, physical therapy, or therapeutic massage can reduce the tension in your neck, thus preventing electric shocks. Transcutaneous electrical nerve stimulation (TENS) has been shown effective in some women suffering from Lhermitte's sign. Certain medications, such as muscle relaxers or sodium channel blockers, can also treat Lhermitte's sign. Though in many cases it is not an indication of a serious and progressing disease, Lhermitte's sign requires a medical attention, especially if experienced with other neurological symptoms, such as weakness in the extremities. Lhermitte's sign is not easy to live with, but many women report significant improvements from combining several relaxation techniques with a balanced diet to support the nervous system.